The family partnership that is buying five Elmwood Avenue buildings from Ciminelli Real Estate Corp. is now proposing to demolish three of them and erect a four-story apartment building. 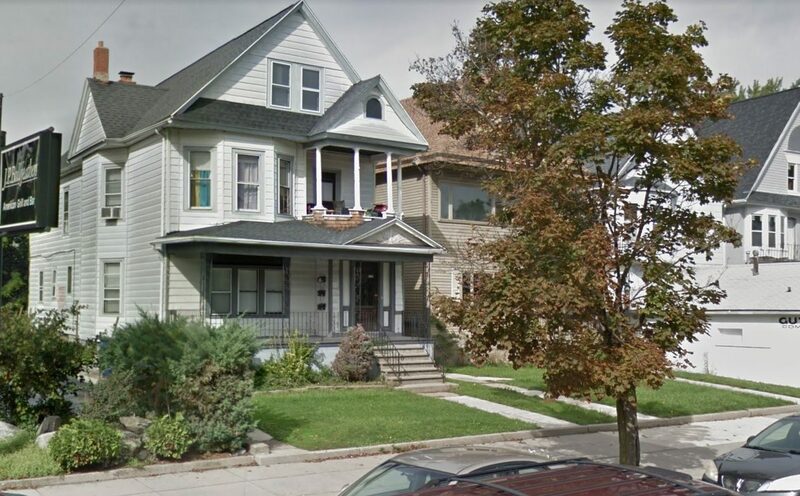 Whitesand Family LP — led by partners Don White and his stepson, Tom Sand — filed an application with the city to combine the lots at 1020, 1024 and 1028 Elmwood into a single 0.34-acre parcel, demolish the three apartment houses and replace them with a "modern, mixed-use" residential and retail building, with four floors. The 42,00-square-foot building would include three storefronts on the first floor, totaling about 3,730 square feet, plus covered parking. The upper three floors would contain up to 27 apartments, but more likely 24, Sand said. It would feature a mix of 14 two-bedroom and 10 one-bedroom units. The project is expected to cost $5 million to $6 million. Whitesand still has to complete the purchase, which isn't likely to close until at least early August. So the investment group isn't anticipating starting construction until spring 2019, followed by about a year of work before it opens. But first it needs to win approval, which could prove challenging, given that it has been met with a mixed reaction since Whitesand indicated its interest in the apartment project when it acquired the property a month ago. "We’re trying to get our variances approved before we spend any money," Sand said, adding that closing the purchase will likely be contingent on getting approval. Paul Ciminelli "paid a lot of money for those properties and he’s trying to recoup," Sand said. "We did not get a deal on purchasing those properties. It cost us a good bit of money." Whitesand is seeking two exceptions from the city's Green Code, for combining more than two lots and for the height of the building. At 50 feet and four stories, it would exceed the maximum height for the Elmwood Village of three stories and 44 feet. Those are two of the same variance requests that appear to have doomed Ciminelli's much larger Arbor + Reverie proposal. That project would have consisted of two five-story apartment buildings and nearly 100 units on a two-block stretch of Elmwood — including the five properties Whitesand is buying. But the plan ran headlong into strident opposition from neighbors and the larger Elmwood community, forcing Ciminelli to abandon one of the buildings and scale back the other, which has since been dropped altogether. Sand said a third request — to build six feet closer to the rear property line toward Ashland Avenue — was abandoned based on neighbor feedback, following a series of four meetings with block clubs and individuals over the past few weeks. Whitesand also agreed to step back the third and fourth floors of the building in the rear, so the apartments don't intrude on neighbors' privacy, and to pull back the fourth floor in front, "so it doesn't appear so big on Elmwood Avenue," Sand said. The firm also cut the amount of retail space to make more room for cars "because parking is a real concern for the people closest to the building," he added. "We’ve been trying to make changes to accommodate their concerns," Sand said. "We really need the fourth floor. We're already losing some square footage by stepping back the elevations of the building." The group argues in its application that the project "will not produce an undesirable change" in the neighborhood or harm nearby properties, calling it a "modern building in scale with the existing walkable first-floor retail spaces on Elmwood." The application also says that the building "will create a cohesive retail space that will serve to enhance the shopping opportunities in the Village and as a result attract more patrons." And it says it needs the retail and residential scale "to achieve its desired return on investment." The Zoning Board will consider the request at 2 p.m. April 17. "It would be great if we get a decision next week, but we'll just wait and see," Sand said. The three buildings are two-story doubles, with a single storefront at 1028 Elmwood that is occupied by a comic book store. The units are mostly occupied, so "they'd have to find another place to live" if the project goes forward, Sand said, although "we have a long timeline here." "We’ve really tried to do some outreach," he said. "We want to get people’s opinions on how the building looks, and we want to follow through on that. We’re trying to be good neighbors." The other two properties are not expected to change much following the purchase from Ciminelli, aside from upgrades or renovations. One of them, at 1010 Elmwood, is the former J.P. Bullfeathers restaurant, while the building at 1006-1008 Elmwood has two retail stores and five apartments. Sand said, "We've already had quite a bit of interest" in leasing the restaurant.